Dhaka, Dec 4 : Bangladesh all-rounder Mehidy Hasan Miraz is now at the top of his career-ranking after the International Cricket Council (ICC) recently updated the rankings. Mehidy remains at 16 spot as a Test bowler with 696 rating points. And thus, he surpassed fellow teammates Shakib Al Hasan and Taijul Islam to set his name as the best Bangladeshi Test bowler as per the latest ICC ranking. 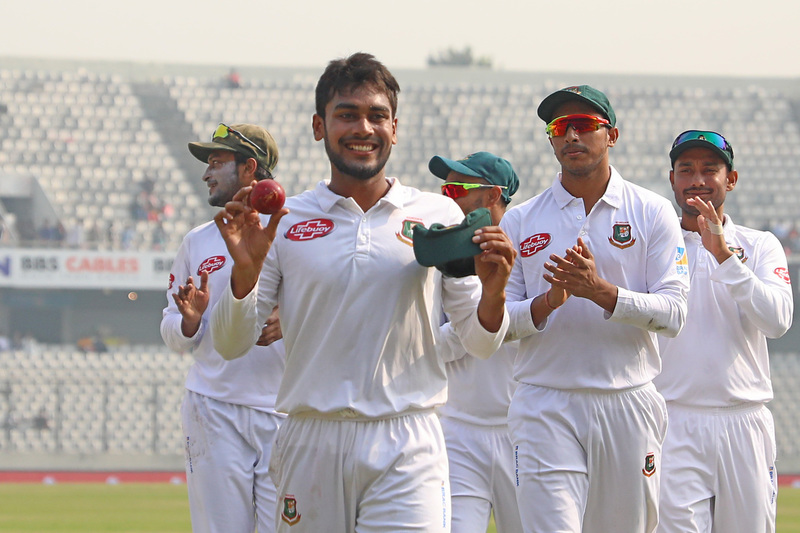 The right-arm off-spinner took 12 wickets in the second and final Test of the series against West Indies in Dhaka conceding 117 runs to seal both the matches of the two-match series. Along the process, Miraz bettered his own record of Bangladesh’s best bowling in a Test by taking 12 wickets for 159 runs in his debut series against England back in 2016. In the just-concluded Test series against the Caribbean boys, Miraz scalped 15 wickets which overall immensely helped Bangladesh to register a clean sweep over the visitors. On the other hand, Shakib Al Hasan and Taijul Islam found their names at 21 and 22 respectively. While losing a higher place as a bowler, Shakib managed to keep his number-one place safe as an all-rounder. With 415 rating points to his credit, the Bangladesh Test captain stays at the top of the list of Test all-rounders. Shakib knocked an effective 80 in the first innings of the second Test in Dhaka that helped him to become the number-one Bangladesh test. Mominul Haque and Mushfiqur Rahim are the other batsmen of Bangladesh to ensure a place in top-30 Test batsmen. Bangladesh will play their next Test series while touring to New Zeland in February- March next year. The Tigers will play three Tests in the series that will commence in Hamilton from 28 February.